The 25-year old Blash started the 2015 at the AAA level with the Tacoma Rainers in the Mariners organization. After struggling to find his swing in the first 11 games of the season Blash was sent to Jackson in the Southern League. 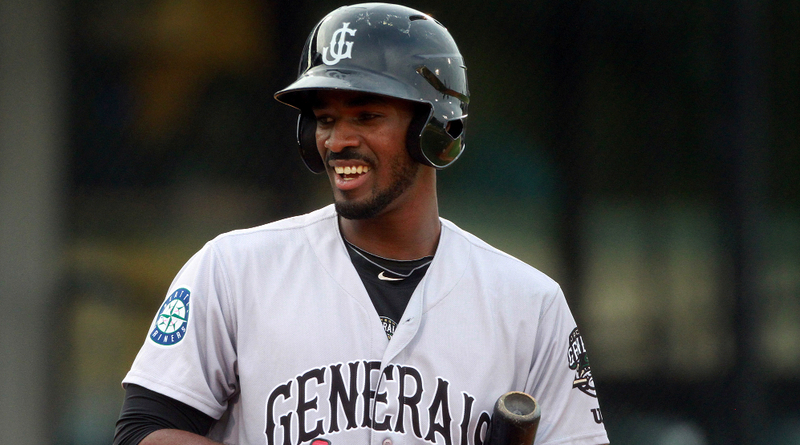 Since joining the Generals, Blash has regained his power stroke at the plate. In 38 games, Blash has hit .273 while connecting on 9 home runs. Blash has a solid slash line of .374/.554/.928 on the season and looks to get another opportunity with Tacoma before the year has come to an end. Jabari Blash got the start for the Northern All-Stars as the teams DH but entered the game as a position player in the 8th inning in right field. Blash who represented the North Stars came to the plate 4 times in his teams 9-0 victory over the South Stars. Jorge Lopez and Austin Ross were able to strike out the power hitting Blash during the game as Blash finished the game 0-4 on the night. Faria has been one of the top stories of the minor league season during the first half. The 21-year old right-handed pitcher is finally starting to get some additional recognition after putting together a 10-1 record during the first half. Faria leads the league with his 1.33 ERA and ranks 4th in his 0.98 WHIP ranks 4th in the league. In his final start before the All-Star game Faria out dueled pitching phenom Jose Fernandez for the second outing in a row. The Florida State League All-Star Game took place June 20th, Jacob Faria was named the starting pitcher for the South Stars and shined in his one inning of work. Faria only needed 12 pitches in order to strike out two batters and serve up a weak grounder to first base. Faria struck out North Stars Chris Mcfarland and Phil Ervin in the first inning while flashing a 91-94 MPH fastball according to reports. The South All-Stars went on to win the game 6-0. Davis Williams was at the game and captured video of Faria’s dominance on the mound. He has allowed us to share his video of Faria’s performance here be sure to take a look and this great footage. Ramirez was named to his second consecutive Southern League All-Star game for the 2015 season. While earning this accolade last year, his 2015 campaign has shown an overall improvement in Ramirez’s game. This season Ramirez has drastically cut down on his strikeouts while upping his batting average from .231 in 2014 to .288 in 2015. Ramirez is also getting on base more while continuing to hit for power, hitting 9 home runs thus far this season. Nick Ramirez played the entire Southern League All-Star Game at first base. The South Stars fell to the North 9-0 on the night. Ramirez came to the plate on four different occasions and struck out once against Twins prospect Jose Barrios. He did draw a walk in his final plate appearance but flew out to Adam Walker and Max Kepler is his other two official at bats. The Angels pitcher of the month for April, Rhoades got off to a hot start to 2015. After starting the season 3-0, Rhoades currently sits 4-4 in 11 starts for the Burlington Bees in the Midwest League. The Illinois State alum has posted a 3.14 ERA while striking out 65 in 66 innings of work. Rhoades has kept runners off the base-paths on most occasions and has a WHIP of just 1.14 in the first half of the Midwest League season. Rhoades entered the Midwest League All-Star Game with his team trailing 2-0 in the fifth inning. The Angels prospect immediately hit James Sheppard, the first batter he faced but then settled in to get Anthony Alford to strike out swinging. After getting a second out, Rhoades got into some trouble allowing a single and walking a batter before Rowdy Tellez grounded into a force out to end the inning. The East All-Stars which Rhoades represented would end up falling to the West 5-0 on the night. The Cardinals signed Robby Rowland in the off-season after he was let go by the Pittsburgh Pirates. After a down season with the Bradenton Marauders Rowland has rebounded and his currently one of the top relief pitchers in the Midwest League. The 23-year-old is 1-1 with a 1.45 ERA with nine saves in 22 games for the Peoria Chiefs this season. His nine saves are good for third in the Midwest League while he leads all pitchers with 22 appearances. Opponents have only hit .170 against Rowland all season. Rowland had the honor of getting the last and final out for the East All-Stars in the ninth inning. Trailing by a score of 5-0, Rowland entered the game with two outs in the top of the ninth inning. Rowland made the most of the one batter he faced striking out Rowdy Tellez swinging to end the inning.